With their 1999 debut, RAY ALDER, JOEY VERA, BERNIE VERSAILLES and PETE PARADA, collectively ENGINE, unleashed on the music community an album that had the critics and the fans rocking back on their heals in astonishment. 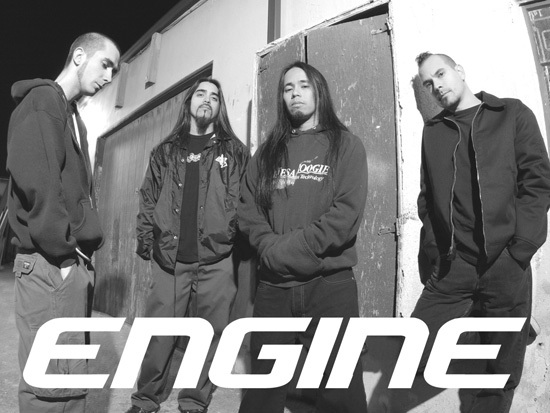 ENGINE’s self-titled debut was an album that was unlike anything at the time while fitting squarely into what was about to happen in popular heavy music. No one expected the Fates Warning vocalist to do something so drastically different from what he had done for ten years with the progressive metal outfit. 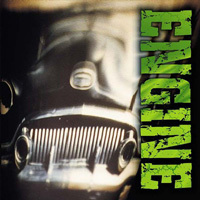 ENGINE’s debut was a thick, groove laden Rock record, which, while dropping enormous bass bombs and groove grenades, saw Ray’s trademark silky vocal delivery transformed into an emotive beast of power, control and unequalled range. 2002 will see ENGINE building on the successes they garnered with their debut. Cohesion has played a major role with “Superholic”. Although, originally considered a side project, Ray, Joey, Pete and Bernie are all in place on “Superholic”, and the result certainly doesn’t sound like a side project. ENGINE has evolved into Hard Rock powerhouse and more importantly a band that, on record & live, schools the current crop of corporate rock clowns. Along with an outstanding version of THE CURE’s “Fascination Street”, “Superholic” feels more diverse then its predecessor, and exemplifies world class production at the hands of Joey Vera (Armored Saint). Standout tracks include “Losing Ground” which would make the perfect soundtrack for one of the many police pursuits on LA’s 405 Freeway, with its driving riff and lyrical interpretation of the decline of humanity and the things that actually matter. “Perfect Star” is a poignant modern ballad in the non-traditional sense of how a ballad is construed, with authentic emotion and considerably more electricity. Throughout, “Superholic” is an outstanding sophomore album put forth by some of the best in the business. 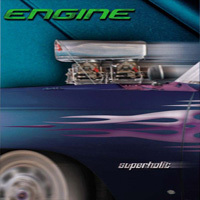 Additionally, ENGINE will hit the tour circuit in support of “Superholic”, a feat not accomplished with their debut, save for a few European festival dates and an industry showcase in Los Angeles. Years of touring experience by all the members ensure that an ENGINE show will be an event not to missed, and a treat for fans of great music performed by gifted musicians. We’ll let the music speak for itself.